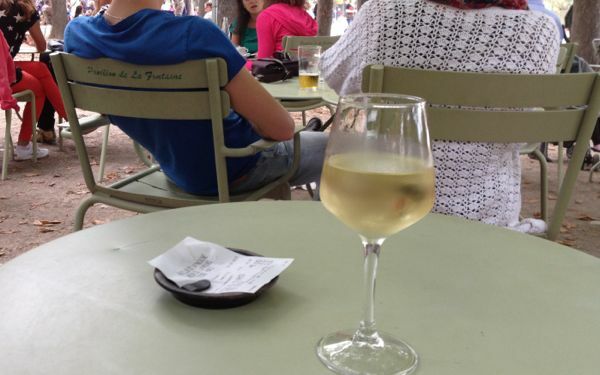 When in France, do as the French do….and this means it is important to follow the customs and etiquette so that you have a more enjoyable and inviting time in France. 1. Do say hello (“Bonjour”) upon entering an establishment (ie. store, restaurant, etc) before you begin browsing or asking questions. Say good-bye (“Au revoir”) upon leaving. 4. Do take the metro (subway) and hang onto your ticket until you leave your station. You could be checked by the police and fined if you don’t have your ticket stub. 5. Do remember to validate your ticket before you board a train. Validating machines are located at the entrance to the “quai” or platform. 6. Do dress appropriately. Jeans are OK, but shorts, flip flops, and running shoes are not. They are for the beach and exercising. 7. Do shake hands with acquaintances or “air kiss” those who are close to you when you are greeting the person. Air kissing involves bringing your cheek close to the other’s cheek as if you are going to kiss the cheek. It is a ritual, called “Faire la bise” and indicates friendship. The number of kisses depends on the region. In most of France, one kisses each cheek once; however, in other areas, it could range from 3-5. What side to start on? I have read one starts on the right; however, opinions differ. 8. Do consider a “Prix Fixe” menu, which will include a starter, main course, and dessert at a fixed price. 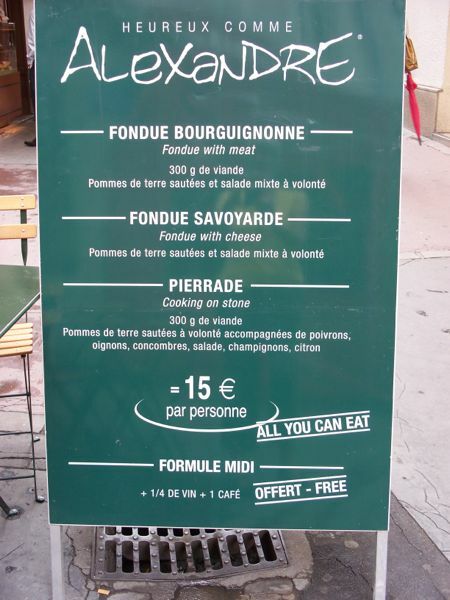 Some restaurants have prix fixe menus with many choices for each course. Some offer menus which include some wine. 9. Do consider ordering a “pichet” of wine. Technically, it is a “jug” of wine, but really it is a carafe of wine and comes in different sizes: 25 cl or 50 cl. (250 ml or 500ml). It is the restaurant’s house wine and is very often very good and a good deal. 10. 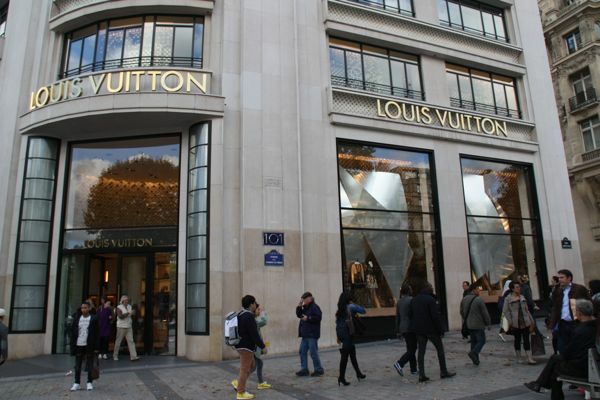 Do expect to find the sale of wine and liquor in grocery stores and the store, Monoprix. 1. Do not use “Tu” (you) to address another person unless that person is quite familiar to you. Use “Vous”, as it is more formal. 2. 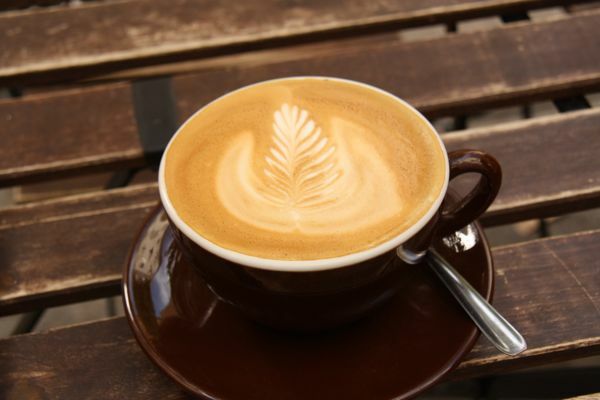 Do not take out coffee and drink it while walking down the street. Drink it at a cafe, either standing at a bar or sitting at a table. 4. Do not order a cafe au lait to end your meal. This drink is taken at breakfast. 5. Do not rush your meal. 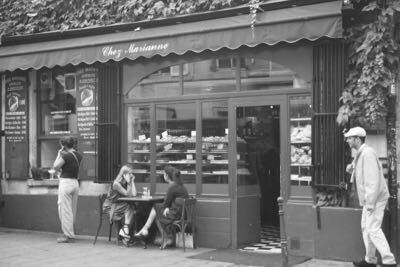 The French enjoy their time to relax over a coffee or meal. You should too and take at least 2 hours to savor the flavors. 6. Do not assume all stores will be open between 12-2 pm as this is when most people have lunch. 7. Do not order or consume soft drinks or coffee with your meal. 8. Do not (have to) tip as the 15% service charge is included in the bill most of the time. The bill will say, “Service Compris”. However, it is a custom to leave an additional few Euros at dinner if the service was exceptional. 9. Do not expect to get ice in your drink. It is just rare to find drinks with ice in France as compared to North America. 10. Do not have dinner before 8:00 pm. It is more acceptable to have a pre-dinner drink (cocktail hour or “apero”) such as wine, beer, a kir or pastis between 7:00 and 8:00 pm. It can be served with nuts or crackers. One thing I would add is that when using the metro you need to watch that you don’t get into the first class by mistake – you can only tell which is first class by where you stand on the platform. I once got a hefty fine by making this error! The good news is that Paris eliminated the 1st and 2nd class system on the Metro in 1991, although France’s national state-run SNCF rail system still has it…and there IS a difference, while back in the 1980s, I didn’t see any difference between the two classes on the Metro. J’aime toute la France! And the people, the cuisine, and the sights! Terrific tips Jan! I especially will remember the jug of wine tip. I’m cool with everything but not being allowed to have coffee after my meal. That’s their custom and that’s fine but to be judged on it is silly to me. I’m not pretending to be French – just trying not to be rude or insensitive. My odds of behaving well are higher if I have caffeine to keep me from being grumpy! Hmmmm….I think I’m pretending to be French. Or I believe I am French! Great list of dos and don’t for France. I like knowing how to behave properly so as not to be rude or stand out too much when I travel. The only one of these I simply disregard is the “Cafe Au Lait only for Breakfast” rule. I want my Cafe Creme when I want it and I don’t care! I often order it at sidewalk cafes in the afternoon while wandering the streets of Paris. Fortunately, so far no Parisian waiter has refused to serve it to me or even scowled when I ordered it! I hear you! I love my Cafe Creme too! Great tips. It’s always good to know these types of things. It’s been a long time since I’ve been to France, but hopefully will get back there soon. The one item that might be an issue for me is not wearing runners. I have arthritis in my toes and if I am going to do any amount of walking, I need to wear my running (actually walking) shoes. When you are in France there is so much walking to do and I don’t blame you for wearing walking shoes. After overwalking in France (and running a 20 km race) I came back with a stress fracture, so I totally understand. Some great tips here! 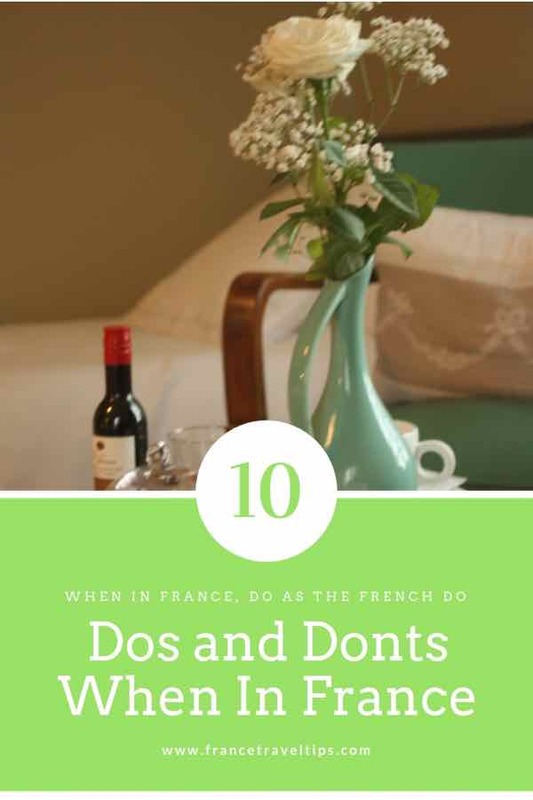 I must confess, a lot of the “don’t do’s” were new to me, and I’m glad to have read this before my next trip to France. Don’t want any faux pas! 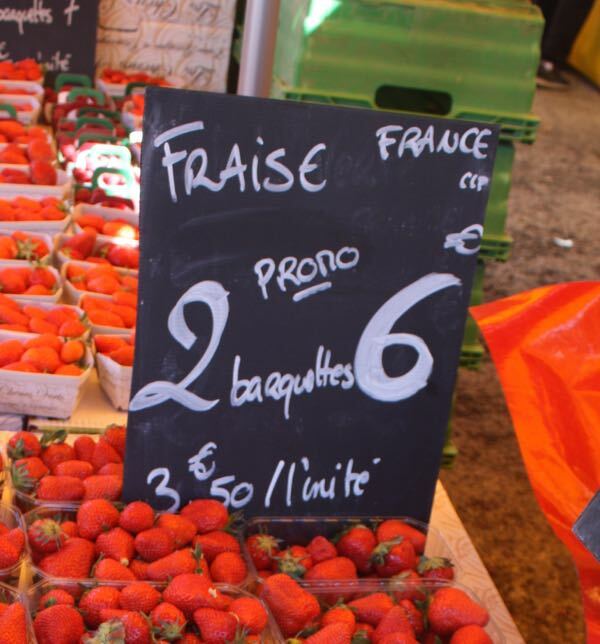 I still make mistakes, but try as hard as possible to speak French so they are a bit more forgiving! Awesome tips! 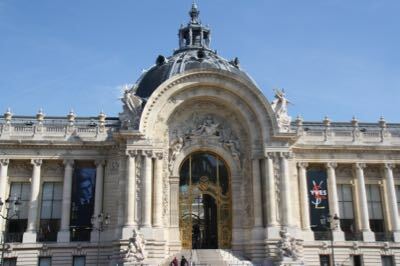 Planning to go there and this blog can really help me while in France. Thank you! While in the past shorts may have been frowned upon, times have changed. I think the summers are very hot now and the French have finally embraced them. When packing for Paris this past summer I wouldn’t let my daughter pack shorts so we didn’t stand out as tourists. After never seeing shorts on French people in all my years of travel there, they were everywhere last summer! Not just on tourists! Even the men were wearing shorts! A longer walking short seemed to be popular for males, but shorts of any length (even VERY short) were being worn by females. Even denim cutoffs! Needless to say my daughter was miffed at me and promptly went out and bought a pair of shorts to wear. We EVEN saw flip flops! Yes, the elusive flip flop worn by Parisians. They were very nice and stylish (not cheap Target type flip flops) but were flip flops none the less. 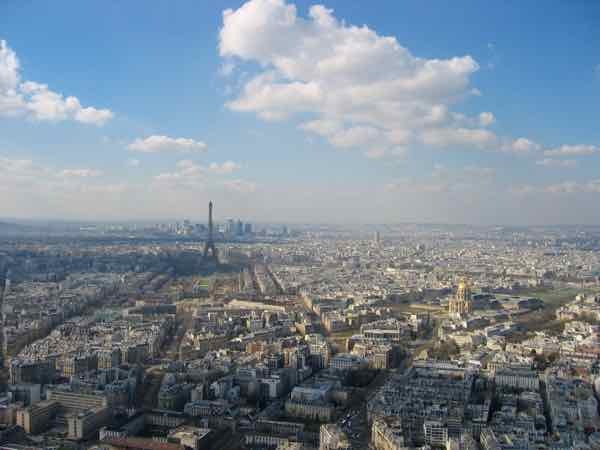 Yes, France was incredibly hot this past summer. I think it’s really the young people (under 18) who wear shorts, not folks my age (well over 18! ).